Working from home certainly has its perks. Not having to deal with overly chatty, productivity-killing co-workers is perhaps one that office staffers envy the most. Short of being rude, there are few viable options for someone in this situation… until now. Nope is a Chrome extension that’s no doubt inspired by similar mobile apps. Powered by Breather, it’s essentially an escape button for awkward or annoying social situations. Upon pressing the Nope button on your browser (and after setting it up with your mobile number), you phone will receive a call that just so happens to be of very high importance (not really). Instead, you’ll be listening to an audio recording with queues that should help you appear as if the call is urgent and must be taken. “Hello, on the count of 3 put your hand to your mouth in alarm as if you’re hearing bad news. Don’t look sad just look concerned. 1, 2, 3. “Yes, of course I can talk now. What’s the matter?” Works every time. With any luck, your annoying co-worker will get the hint and go find someone else to bother. 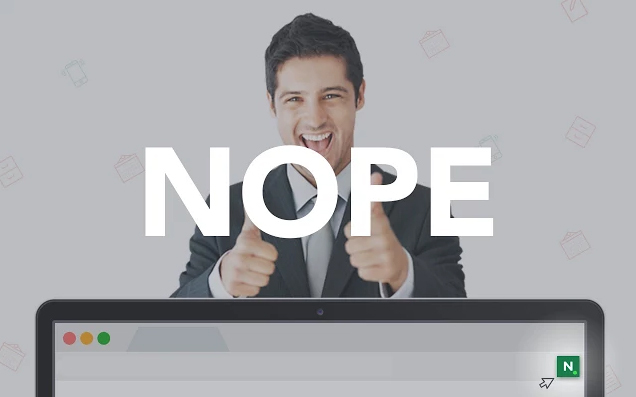 Ironically enough, Nope is a distraction designed to avoid distractions.